The San are the oldest inhabitants of southern Africa, where they have lived for millennia. The term San is commonly used to refer to a diverse group of hunter-gatherers living in the region who share historical and linguistic connections. They were also called Bushmen, but this term is considered derogatory and is no longer used. David Lewis-Williams has spent 53 years studying the San people, publishing his first article in 1962. His 20th book on the San – Myth and Meaning: San-Bushman Folklore in Global Context – has just been published (see extract below). Lewis-Williams believes that the future of the San is uncertain. South Africa began passing laws in the 1960s to take over large sections of the traditional hunting lands of the Kalahari San for game and nature reserves. Although the South African government is now much more helpful, the San people hardly have any land on which to hunt and gather. Lewis-Williams says they face a battle to hang onto customs in the face of modernisation. The small number that remain stick to their beliefs and traditions. In his latest book, Lewis-Williams excavates meaning from the complex mythological stories of the San-Bushmen to create a larger theory of how myth is used in culture. He says the myths are not detailed in the paintings, but that the paintings and the myths derive from the same set of religious beliefs. 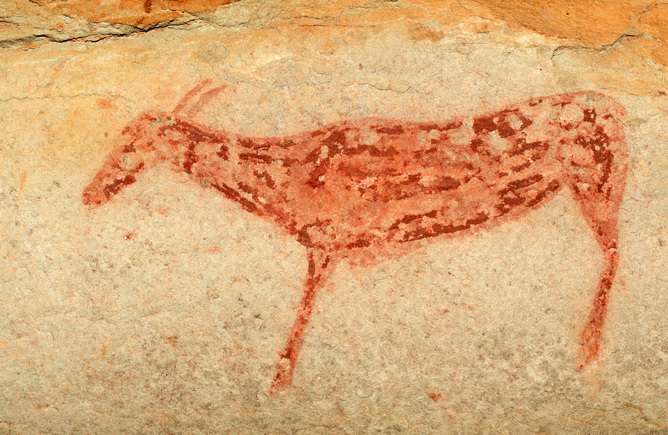 Lewis-Williams explores the connection between myths and rock paintings in the Drakensberg. The paintings on the walls were not pictures of myths but actually important words or phrases – what he called small but valuable "nuggets" – about San life. One of the results of my own work has been that apparently simple texts such as the Song of the Broken String are studded with far-reaching words and concepts that are unintelligible to, and therefore easily missed by, modern readers. These "nuggets", as I call them, encapsulate meanings that bring San lore and myth to life. Specific narratives are seldom pan-San, but, as we shall see, nuggets frequently are. Nuggets should not be confused with the cross-cultural narrative motifs that, for instance, the folklorist Sigrid Schmidt used in her valuable catalogue of Khoesan folklore. Nor are nuggets equivalents of Claude Levi-Strauss' "mythemes" that, in his formulation, frequently comprise a subject and a predicate. Rather, nuggets are single words denoting, for example, items of material culture that have rich associations, or parts of the natural environment with cryptic connotations. They may also be idiomatic turns of phrase that are opaque to outsiders, or ellipses that hearers would have been expected to complete from their own knowledge. Although diverse, nuggets are important because they invoke reticulations of fundamental beliefs and associations that may not be explicitly expressed in the text. As a narrative proceeds, they add up to a powerful, all-embracing cognitive and affective context. They provide a counterpoint to the manifest plot of a tale, enriching its harmonies and resonances. The manifest meaning, or "lesson", of a narrative (if we assume one can be discerned) should be seen within this, for Westerners, allusive and often elusive context. My use of the concept of nuggets explores, in part, the same territory as the notion of "key symbols". Although broader than key symbols, the notion of nuggets does imply a summarising or synthesising function. In Sherry Ortner's words, they "relate the respondent to the grounds of the system as a whole". Respondents seldom analyse nuggets or key symbols, but they have absorbed their referents in the course of daily life. Indeed, nuggets are part of the "taken-for-granted" aspects of myth. Often indigenous narrators ignore the most important contexts and elements of a myth as being so obvious that they cannot imagine that their auditors do not think in terms of them. They themselves seldom, if ever, articulate them. In ancient Greece, for instance, writers and speakers rarely retold myths in detail. They more commonly merely referred to an incident or character in a myth on the assumption that their readers or hearers would know the full narrative. Similarly with the San, we must constantly remember that in traditional circumstances the hearers were already familiar with the whole tale. They would mentally fill in "missing" episodes or details as the narrator progressed. It was therefore not necessary for narrators to spell out every incident in the tales that they were performing. It was not even necessary that a tale be told through to its end: everyone knew how it ended. The taken-for-granted factor was high. Within an encompassing intellectual universe like this, a small part, a nugget, can readily stand for a vast, unarticulated whole. Indeed, synecdoche is intrinsic to a San speaker's recounting and manipulation of narratives. In Chapter 7 I argue that this principle applies, in modified form, to San imagemaking as well. An appreciation of nuggets soon destroys the illusion of simplicity in myth and art.